Take Jharkhand. As Satav says the BJP’s vote share dropped about 9 percentage points between the general election in April-May 2014 and the state assembly election in November-December 2014. But that’s not unexpected: the chart below shows the BJP has lost 7-9 percentage points in vote share between national and state elections held in close succession since 2004. This is also true of state assembly constituencies won (see chart below). 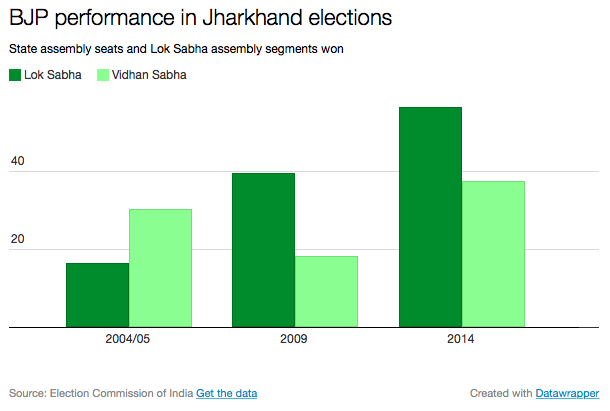 In both 2009 and 2014, the BJP in Jharkhand won 19-20 more state assembly segments in national elections than it did in the state elections that followed a few months later. Note that 2004/05 is an exception partly because the BJP stood alone in the 2004 parliamentary election but allied with the Janata Dal-United in 2005 for the state election. This pattern occurs presumably because many Jharkand voters chose to vote for the BJP in national elections but switched to a regional party such as the Jharkhand Mukti Morcha that seemed a more viable option in state politics. The BJP’s position in Jammu appears unchanged between the national and state elections. While it’s true that the party’s overall vote tally in Jammu and Kashmir has fallen, its grip on Jammu hasn’t really weakened. The BJP won 24 assembly segments (in the Jammu and Udhampur parliamentary constituencies) in the general election, and won 25 assembly seats in Jammu in the subsequent state election. There is therefore no real evidence to suggest that the Modi effect (or anti-Congress sentiment) has waned either in Jammu or Jharkhand. As your data shows BJP (under the old leadership) typically lost 7-9 percent points during the state election compared to loksabha election. Now the data says that in the case of Modi as well, BJP lost as many percent points as they typically would. It would have been very interesting if under the new leadership BJP would not have lost as many votes as earlier. I’ll clarify my point. 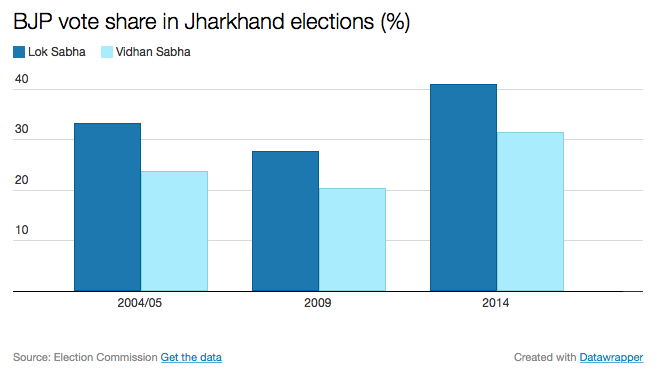 Think of it this way: Jharkhand witnesses two elections in quick succession and then a lull for four years. So, first election reflects the political factors at that point in time ( economy, social & religious strife, anti-incumbency and all other political factors that one can count). Now since elections are held at close succession, we have a controlled experiment, where macro political situations ( like economy, social strife) can be assumed to remain constant but only the micro ones are really changing ( like love for some leader a.k.a Modi effect). I do not see the data showing the Modi effect – the data is quite neutral infact. I agree that we should look at this as a kind of controlled experiment. But the “Modi effect” is reflected in the jump in the BJP’s state election vote share from 20.2% in 2009 to 31.3% in 2014. A scenario is which the BJP’s state vote came close to the national election vote share of 40.7% in Jharkhand would require it to jump 18-20 percentage points, double the increase in national election vote share since 2009, which seems ambitious.